If you were around during either run of “The Jetsons”—first in 1962 and again in 1985—you may have watched the show and wondered if the technology the futuristic family used would ever become a reality. In fact, quite a few of the gadgets used on the show have become commonplace in real life. From robotic maids to video chatting, here’s a look at how the future predicted by “The Jetsons” has become the present, and how you can get in on it today. The Jetsons had robotic helpers that took care of all sorts of daily tasks around the house. Rosie, the family’s robot maid, was always working to keep their home in tip-top shape. 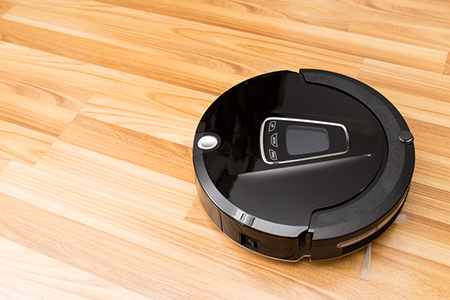 While we may not be quite at the Rosie level with our robots, little helpers like the Roomba from iRobot can get you pretty close. Roomba will take care of the vacuuming for you. It may still need some maintenance—like emptying dust bins or making sure the floor is clear so it can do its job—but if you hate vacuuming, this little guy is going to be your best friend. These types of home automation devices promise to free up tons of time for more important activities in your day-to-day lives. Way back when Steve Jobs was just a boy, the Jetsons had little square watches they would watch TV on. While the Apple Watch doesn’t have the ability to stream television—yet—it does bear a striking resemblance to the gadget the Jetsons used almost 50 years before the Apple Watch was unveiled. Even if you can’t catch up on your Netflix queue, today’s smartwatches have a lot of futuristic capabilities. You can take calls, set reminders, check sports scores, see weather forecasts, and do other tasks right on your wrist. Another technological capability that probably seemed far-fetched at the time “The Jetsons” aired was video chatting. The characters would call each other up and communicate as if they were face-to-face. These days, apps like FaceTime and Skype make it as easy as tapping a contact name. Of all the advances in technology that have accompanied the smartphone craze, video chatting might be the most life changing. Grandparents can see their grandkids from thousands of miles away at any time. Soldiers can chat with their spouses and children from across the ocean. The impact this tech has had on families can’t be overstated. In “The Jetsons,” George was woken up each day by a talking alarm clock built into his bed. After being rudely startled awake, he could silence the alarm with his own voice—usually an angry grunt or groan. If you want the talking alarm clock experience, plenty of options are available. Smartphone apps like the Rock Clock allow you to rise every morning to Dwayne Johnson’s soothing vocals, while dedicated alarm clocks that talk to you are available for the old-school consumer. It isn’t just alarms that talk, though. It’s possible to have anything on your screen read to you using accessibility tech like screen readers, and digital assistants like Siri and Alexa will not only speak info to you, but also have actual conversations with you. At a time when many TVs were still black and white and all of them were thick and bulky with tiny screens, “The Jetsons” featured flat-screen TVs with huge screens that lowered from the ceiling. In the ’60s, this would have been unthinkable. Today’s televisions are ultra-thin and often very light with huge screens and ridiculously high resolutions. LG unveiled a model at CES this year that is less than 2.6 millimeters thick and weighs only 17 pounds—and it’s a 65-inch display! TVs that retract into the ceiling are also a thing. Companies like Nexus 21 can install a TV concealment system that makes it impossible to tell anything is there until you’re ready to watch, keeping your walls and living space open until show time. The Jetson kids were dropped off at school each day by robotic drones—a far cry from the school buses most of us grew up with. While we are still a long way off from personal drones to chauffeur us around, the technology is advancing rapidly, and drones are being used for a variety of purposes. Consumer-oriented drones are basically futuristic RC cars, and military drones fly combat missions while keeping our troops out of harm’s way. Even Amazon’s delivery drones can have an order to your doorstep in less than 30 minutes. Self-driving cars are also coming along nicely, so it might not be long before these technologies converge to bring us our very own Jetsons-style transport pods. A piece of technology that’s easy to miss both on “The Jetsons” and in everyday life is the PillCam. On the show, George swallows a little robot that travels around his body and performs a checkup. If you’ve had any sort of digestive issues in the last several years, the chances are good you may have swallowed a very similar device. The PillCam is exactly what it sounds like—a camera in a pill-shaped case that you swallow. It can be a little hard to choke down due to the size, but once swallowed, the camera goes to work, imaging your digestive tract and transmitting the info to a receiver. This helps diagnose a variety of illnesses, like Crohn’s disease, and helps the patient avoid a much more elaborate and invasive endoscopy procedure. “The Jetsons” first aired in 1962, and, 50 years later, the show’s futuristic vision of life has very nearly become a reality. What do you think our homes and lives will be like in another 50 years?